Any kind of cross-cultural collaboration of the arts is bound to throw up interesting—and unexpected—results. Any kind of cross-cultural collaboration of the arts is bound to throw up interesting—and unexpected—results. 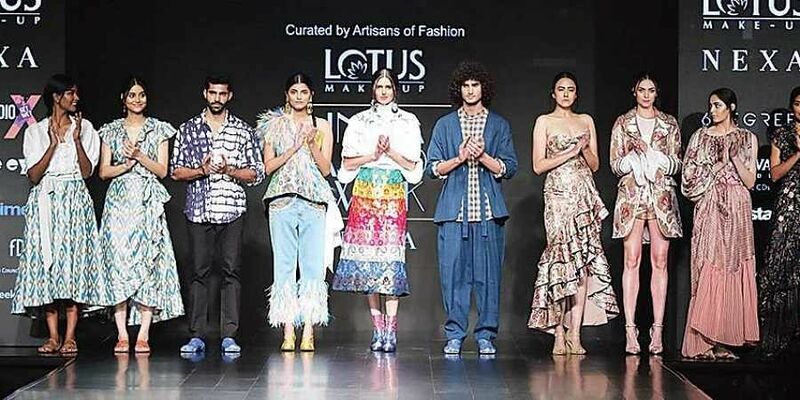 If you were part of the audience watching the Indo-Australian Project at the Lotus Makeup India Fashion Week in Delhi—a presentation of five Australian designers’ collections— you would know where this is headed. The project was conceived as part of an Indo-Australian agreement between the Union Ministry of Textiles and the Australian government to support the ongoing cultural and trade relationships in the fashion and textile industries. Caroline Poiner, the founder of Artisans of Fashion (AoF), was engaged by the Australian High Commission to curate the collections and the event. Swathes of rich Banarasi, brocade, tangail and ikat textiles woven by Indian handloom weavers were used to create capsule collections by We Are Kindred, Romance Was Born (both used brocades from Uttar Pradesh), ROOPA (silks and tangail from Bengal), Brothers Earth (with Naushad Ali using natural indigo-dyed handloom textiles from Tamil Nadu) and Cassandra Harper (Telengana ikat). “Handwoven textiles bring a unique character to life in the garment. We are living in an exciting time in fashion where the story behind the garment is more important than ever. This intersection of story and the richness of handloom inspired Brothers Earth and Naushad Ali to collaborate on this men’s capsule,” said Ali after the show. Cassandra Harper used the ikat weaves of Telengana in her separates. “This project deepened my love and respect for the incredibly talented artisans of India,” said Harper. The standout collection was by Roopa Pemeraju whose SS19 line paid homage to the ancient network of trade routes that once connected the East and West. Her creations used incredible weaves that behold ancient stories told through print and textiles. “AOF created this platform for Aussie designers as no one knew what India was all about a few years ago in terms of artisanal products. I was born and raised in India, my team is in India but still it’s very hard to get things off the ground. Creating and building the artisanal community and connecting the brands and making it happen was not possible without AoF’s vision,” said Pemeraju after the show. Artisans of Fashion (AoF) was founded in 2012 with the intent to preserve traditional craft techniques by linking the artisans to the international market through the influential fashion and textile industry. “We work with hundreds of weavers and artisans creating access to an extensive range of handloom textiles as well as traditional embroidery, dyeing and printing techniques, bringing the traditional craft of the artisans to the world of international design. The focus is on empowering women and marginalised communities who have little access to alternative sources of income. The aim is to engage with these communities to help create high quality, handcrafted product with appeal for the international market and facilitate ongoing relationships and access between the designers and artisans,” said Poiner. Indeed, here’s hoping these efforts do bolster the market situation and provide livelihoods for the skilled but poor artisans.